Is your review process performing below expectations? Fix the performance review with the wisdom of crowds! Today's most successful companies are transforming their predictable "one-way" review processes into dynamic, collaborative systems that apply the latest social technologies. Instead of a one-time annual evaluation of performance, managers and employees receive collective feedback from everyone across their company. It's all achieved through crowdsourcing, and it generates more accurate, actionable results than traditional methods. CROWDSOURCING:Applying the same techniques that companies like Apple, Angie's List, and Zagat use to inform customers, you can gather the same kind of data to inform managers. SOCIAL MEDIA TECHNOLOGIES:The most revolutionary communication tools since the telephone, these technologies have singlehandedly created a new language of business. ORGANIZATIONAL CULTURE: When managed well, it's one of the most effective tools for building and maintaining a competitive advantage. These three assets come together for the purpose of evaluating performance in the practice of social recognition--a system in which all employees recognize each other's great work on a daily basis. Social recognition creates engagement, energy, and even happiness in a company--leading to the ultimate goal of a Positivity-Dominated Workplace. The Crowdsourced Performance Review provides the key to seizing your company's competitive edge with a new ground-breaking performance management system. Apply the techniques in The Crowdsourced Performance Review to make your processes exceed expectations. "Eric Mosley revamps employee performance management in THE CROWDSOURCED PERFORMANCE REVIEW. His book describes the importance of employee passion and happiness as the best measurement for success." ~Tony Hsieh, New York Times bestselling author of Delivering Happiness and CEO of Zappos.com, Inc.
“Take advantage of the technology and data available to you and turn the dreaded performance review into a powerful force for decision-making and culture-building by using the methods outlined in this clear and clever guide." 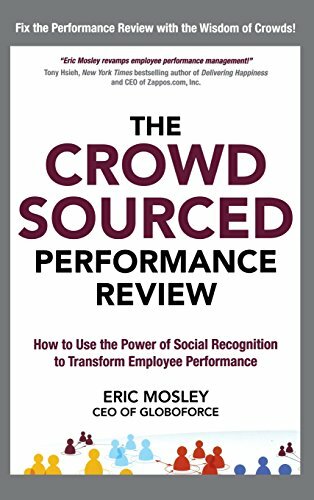 “THE CROWDSOURCED PERFORMANCE REVIEW should be at the top of every HR professionals reading list. It shows convincingly why the traditional performance review doesn’t work, and how social recognition is the key to a performance system that actually makes an impact. "Eric's book is a provocative portrait of corporate problem solving. With an engaging, fresh view of employee performance, he gives HR executives a new way to rethink appraisals. Crowdsourcing recognition is the innovation for performance management that we've been waiting for." ~ David Zinger, Global Engagement Expert and Founder of the Employee Engagement Network.